Teams from the EuroTech Universities Technical University of Munich and Ecole Polytechnique Fédérale de Lausanne have excelled in this year’s SpaceX Hyperloop Pod Competition. As in 2017, TU Munich’s team WARR Hyperloop won the competition, reaching almost twice the speed as last year with 467 km/h (290 mph). EPFL’s team EPFLoop raced to a third-place finish, an impressive result for a first-time competitor. 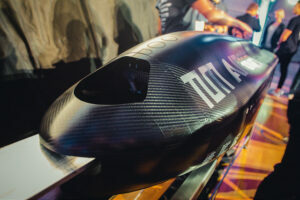 In order to accelerate the development of functional prototypes and encourage student innovation, SpaceX announced the Hyperloop Pod Competition in 2015. It challenges university teams to design and build the best transport Pod. The concept envisions transport capsules, or pods, that will travel at high speed – close to the speed of sound – in a near-vacuum environment through a system of tubes. The 2018 competition took place at the SpaceX headquarters in Hawthorne, California, on 22 July.